Cubanisimo Vineyards kindly mentioned our presence at the South Beach Wine and Food Festival on their Cubanisimo Blog. If you get a chance, seek out their Pinot - you won't be disappointed. We look forward to visiting them again at next year's festival. On Saturday April 14th, several Virginia wineries will be pouring their wines at the Reston Town Center as part of the first Great Grapes festival of 2007. Throughout the year, the organizers of Great Grapes at uncorkthefun.com host several festivals in the mid-Atlantic region. The Reston event is the only Great Grapes festival held in Virginia and runs from 11am-7pm. Onsite tickets cost $25, whereas $20 advanced tickets can be purchased at uncorkthefun.com or by phone 800-830-3976. The participating wineries create a good representation of the various types of wines made within the state. There will be award winning vinifera wines, excellent Chambourcin and other hybrid wines, fruit wines, and hopefully several types of Norton. The participating Virginia wineries are North Mountain Winery & Vineyards, Rebec Vineyards, Horton Vineyards, Veramar Vineyard, Lake Anna Winery, Rockbridge Vineyards, Stone Mountain Vineyards, Peaks of Otter Winery, Cave Ridge Winery, and Williamsburg Winery. There will also be one out of state winery, Thistle Meadow Winery, from Laurel Springs North Carolina. In addition to wine, several entertainers will be performing throughout the day. Make sure you don't miss the phat blues sound of The Kelly Bell Band - they play from 1:15-3:00. We will be in the front row. Muscadine or Vitis rotundifolia is often considered “America’s First Grape” and was consumed by the earliest explorers and settlers. In 1840, North Carolina was the largest wine producing state in the Union and the best selling wine before Prohibition was a muscadine blend called “Virginia Dare”. Today the grape flourishes in the southeast United States, where several types of muscadine are grown: Scuppernong, Carlos, Magnolia and Noble. Muscadine wine can be made either sweet as a dessert wine or sometimes dry. North Carolina is still the largest producer of muscadine wine and state organizations encourage its production from the North Carolina Grape Council to the North Carolina Muscadine Grape Association. The North Carolina State Fair even has a separate entry for Best Muscadine wine which was won by Old North State Winery’s Starlight White in 2004. Hinnant Family Vineyards & Winery is the largest muscadine vineyard in North Carolina. The Hinnant family started growing muscadine grapes because of the tremendous health affects noted above. They currently produce 5,000 cases of muscadine wine annually from dry Noble and Carlos to their Muscadine Blush and sweet Tarheel Red. Their wines have won awards through out competitions in the southeast as well as the New York Finger Lakes International Competition. In addition to the muscadine wine, the winery produces thousands of gallons of muscadine juice which is sold to grocery stores. Whereas their sweet muscadine wines have gained customer acceptance in the southeast, Hinnant Family Vineyards is working to convince the wine public that their dry muscadine wines are good alternatives to the more familiar dry red wines. They are looking forward to the day when muscadine wines become a household name. There are also several muscadine producers distributed throughout South Carolina, Georgia, Alabama, Mississippi, Florida, Louisiana, Tennessee, and even Texas. One of our favorite wineries, South Carolina’s La Belle Amie Vineyard, provides several opportunities each year to sample their muscadine wine by hosting themed festivals. In Florida, the muscadine grape grows with a slightly thicker skin then its northern neighbors, which produces a slightly sweeter grape. Florida wineries take advantage of this anomaly by creating sweeter versions of muscadine wine. Rosa Fiorelli Winery & Vineyard’s Red Muscatine Dessert is a Gold winning dessert wine and San Sebastian Winery fortifies muscadine to produce an excellent port. During our Compass Tours we have visited several wineries that specialize in muscadine wine and have become enthusiastic supporters of the grape. In addition to the discussed health benefits we believe muscadine wine should have a spot in your wine cellar. Recently we were able to visit the newly opened Maryland winery, Frederick Cellars. Just before opening, the winery was able to purchase Catoctin Vineyards and hire Robert Lyons as their new winemaker. This was a major coup since Mr. Lyons is noted as being perhaps Maryland's best winemaker. He produced several award winning wines under the Catoctin label - including the 2004 Governors Cup for his 1999 Cabernet Sauvignon. Now, two years later, Lyons and Frederick Cellars repeated this feat with the 2006 Governors Cup for their 2001 Cabernet Sauvignon. Made from grapes grown in the Mountain Creek Vineyards in the Catoctin AVA, this is a full bodied wine with a slight peppery finish. But why the award? The wine's complexity; balance; I don't know. Maybe because this wine has character – a tangible that can’t be described accurately but makes this an excellent wine. The downside; this wine isn't cheap - at least for Maryland wines. Priced at $30, the benefit of being a cup winner has definitely been factored into the price. We thought it worth the price; but you make the call. For quite some time, we've wanted to review one of Carlson Vineyard's wines, but just couldn't decide which one. So instead, we decided to select a few of our favorites from this Grand Valley winery. The Grand Valley is noted for its bountiful fruit production so it’s no surprise that Carlson Vineyards makes several excellent fruit wines. Their Cherry Wine is our favorite and we usually purchase 5 bottles a time – the maximum that Virginia allows for a single shipment. This wine is made from 100% Montmorency Pie cherries and is sweet and tart – sweet up front and tart at the finish. We drink it mixed with seltzer or sometimes as Carlson recommends, in a glass laced with chocolate. They call it “chocolate cherry pie without the crust”. For white wines, our favorite is their Laughing Cat Riesling. In our trip to the Grand Valley, we were surprised to find that the local Rieslings were very similar to those made in New York’s Finger Lakes. Not surprisingly, Carlson’s 2003 Riesling was the 2004 Riesling Champion at the 2004 International Eastern Wine Competition. Their latest vintage is a semi-sweet wine full of apricot flavor. The finish is nicely acidic and tart which is a perfect balance to the fruit. Finally, we can’t forget their T-Red Lemberger. This wine is made from 100% Coloradan grown Lemberger grapes and is made with a light body from aging just lightly in oak. This process creates a full berry flavor, with a surprising spicy finish – reminiscent of a Syrah. The low tannins also provide a very smooth finish. Blaufränkisch, Limberger, Kékfrankos, Franconia, Blauer Limberger, Lemberger. Six distinct grapes? No, each is a synonym for the same grape - thought to be related to the Gamay - that produces dry, medium bodied, fruity, red wines. Called Lemberger in many parts of the U.S. (so that it is not associated with the Limberger cheese), this grape is known as Limberger in Germany, Blaufränkisch in Austria, and Kékfrankos in Hungary. Preferring a warmer environment, Lemberger thrives in Burgenland in Austria and around Sopron in Hungary. According to historians, the wine was very popular with both Napoleon Bonaparte and Otto von Bismarck. In the United States, this grape is vinified primarily in New York and Washington State. Large scale wine making is relatively a recent phenomenon in Washington. Initially European immigrants planted the first vines in the early 1880’s, but it wasn’t until irrigation projects were able to capture the runoff from the melting snowcaps of the Cascade Mountains did wine production expand. The first commercial-scale plantings began in the 1960’s. Since then, the Washington wine industry exploded, where there is currently close to 300 operating wineries, producing award-winning Cabernets and Merlots. According to Dr. Jim Harbertson, Washington State University Extension Enologist, Lemberger first came to North America in British Columbia and plantings were established in Washington in 1941. The first commercial wines from Lemberger were produced in Washington in 1980. Today only about a dozen Washington wineries produce Lemberger, but the strong aroma of black cherry and just a hint of spiciness make this brilliantly colored wine one of the Northwest's best kept secrets. According to Micheal Cavett of FairWinds Winery, “Lemberger could become to Washington what Pinto Noir is to Oregon”. Another Washington winery that has been successful with Lemberger is Olympic Cellars. The winery opened in 1979 as Neuharth Winery and was one of the first 15 commercial vineyards opened in Washington and the first on the Olympic Peninsula. With the passing of Mr. Neuharth in the early 1990’s, the winery changed names to Olympic Cellars and was purchased by Kathy Charlton in 1999. Ms. Charlton continued making the "Dungeness Red" - Lemberger and considers it their Heritage Brand and makes the legacy Rose Lemberger in their Working Girl series. Both wines have won the current and previous owners many awards since the varietals were first released in the early 80s. The Dungeness Red has is very special to the current owners because they won their first Gold Medal with the 2001 vintage and the current 2003 vintage took Gold at the Central Washington State Competition and Silver at the 2005 Dallas Morning News Wine Competition. Olympic Cellars purchases the Lemberger grapes from Champoux Vineyards, which is renowned in Washington for their Lemberger grapes. Olympic Cellars sells Lemberger not only because of its heritage in the winery’s history, but also because they like offering less well known wines to their customers. Lemberger is a great choice because its Beaujolais style is appealing to "white wine" drinkers; it has low tannins, a soft finish and great fruit on the nose and finish. They have even noticed that the cherry finish is noticed even by the novice wine taster. As with other wineries selling Lemberger, Olympic Cellars must first explain to first time visitors that the wine has nothing to do with the cheese, but after describing the grape and wine, most visitors leave with at least one bottle. Ms. Charlton recommends chilling the wine for about 10-15 minutes to enhance the flavor (especially in the summertime) and pairs the wine with most "everyday" meals such as pasta, food off the grill and even fish. The wine can also be served after dinner because Ms. Charlton also strongly recommends drinking the wine with chocolate. Lemberger is an important component of Olympic Cellars wine selection and the winery believes that it may become the next “grape of fashion". In Colorado, Cottonwood Cellars had been growing Lemberger for many years. The winery opened in 1994 and chose Lemberger initially because of its cold hardiness; it needed to survive annually with our 5600' altitude and cold climate. This is their 6th vintage and they have never lost a complete crop. Cottonwood Cellars also says that Lemberger vines are very happy in Colorado at the higher altitudes and where the days are warm, but not hot, and the nights are cool. “Happy vines produce great wines.” And Cottonwood has produced great Lemberger wines. Their version has a deep raspberry color and lovely fruit flavors and is recommended with most food, especially pork. Each vintage always sells out and the 2003 Cottonwood Cellars Lemberger was awarded a Bronze medal at the 2005 San Francisco International Wine Competition and their 1999 vintage received a Certificate of American Merit from the 2000 Jefferson Davis Invitational. Once again, name recognition seems to be the only hindrance. In New York State, Lemberger is usually referred to as Blaufränkisch and is vinified in the Finger Lakes region and on Long Island. One Long Island winery, Channing Daughters Winery, has had considerable success growing and selling their Blaufränkisch. They sell out annually of this varietal which is noted for its dark berry fruit, spice, and meaty qualities, which matches with all sorts of game along with a variety of cheeses. In addition they blend Blaufränkisch with their Merlots and Cabernets to add color, spice and fruit. Channing Daughters does not enter contests or submit wines for awards, but the fact that their Blaufränkisch sells out annually validates the quality of this wine. In Michigan, Domaine Berrien Cellars started growing Lemberger because they felt that the European climate in Germany/Austria where Lemberger is grown was similar to their climate in SW Michigan (the Lake Michigan Shore viticulture area). The winery was established in 2001 and bottles wine from grapes grown completely from their vineyards. One of these wines is a vintage Lemberger that is a medium-bodied oak-aged red wine. According to the wine’s tasting notes it is “rich, toasty overtones and slightly spicy flavors with a dry finish”. The winery encounters similar questions about the wine’s name, but also notes that many customers are surprised to learn that the red wine originated in Austria and Germany. Apparently Riesling is thought to be the only wine produced in these countries – there is a lot of work ahead in order to educate the American public. Much more educated, at times, are wine officials. For the past two years, the winery’s vintage Lemberger has won numerous medals. The 2002 vintage won Gold medals at the Great Lakes Wine Competition & the Indiana International Wine Competition as well as a Silver medal at the Michigan State Wine Competition. The 2003 Lemberger won Silver medals at the Tasters Guild International Wine Competition & the Great Lakes Wine Competition and a Bronze medal at the Indiana International Wine Competition. These facts demonstrate once again that American winemakers can produce quality wine from non-traditional grapes. Lemberger or Blaufränkisch or Kékfrankos is a wine that we believe, once tried, will become a staple in any wine collection. Thankfully, in the United States, more wineries are choosing to cultivate this grape and this wine should become available to most consumers, regardless of their geographic location. And, when tasting this wine at a winery, please don’t mention the cheese. They’ve heard that comment enough. On Saturday and Sunday, March 10 & 11th we attended the 2007 Washington D.C. International Wine & Food Expo, held at the Ronald Reagan Building and International Trade Center. The sponsors of the Expo promised that the 280 wineries on hand, pouring over 1,100 wines would provide loads of fun for everyone. Based on the size and positive assessments from the participants – I think they succeeded. These 240 wineries represented wine regions from North and South America, Europe, South Africa, Australia and New Zealand. For the United States, there were wineries from California, Washington, New York, Virginia, and even Maryland (our good friends from Linganore Cellars). Strategically located next to the entrance and wine glass booth, Linganore had a steady crowd tasting their popular Terrapin White, Traminette, Merlot, and Bacioni wines. The Virginia wineries were represented by Orange County’s Horton Vineyards and Barboursville Vineyards as well as the Shenandoah Valley’s Rockbridge Vineyards. New York Finger Lake wineries were represented by Bully Hill Vineyards, Hazlitt 1852 Vineyards, Dr. Konstantin Frank's Vinifera Wine Cellars, and Standing Stone Vineyards. Appearing for Long Island were Wölffer Estate and the Long Island Meadery, who spent two days explaining the difference between mead and cyser. For those who don’t know, expect a Wine 101 series on Mead later this spring. Covey Run and Domaine Ste Michelle represented Washington wineries, while several Napa, Sonoma and Lodi based wineries represented California. As expected, we tasted several excellent California wines. Our first was the Petite Sirah and Pinot Noir from Sonoma’s Foppiano Vineyards. This is the second oldest continually operating winery in California; the winery survived prohibition by selling grapes to home wine-makers (which was still legal) and by outright bootlegging. Foppiano’s website contains photos of police officials destroying barrels of wine – what a shame. Next, we really liked Alexander Valley Vineyard’s Cyrus, a full bodied Bordeaux blend aged 24 months in oak and 9 months in the bottle. We also found that Four Vines Winery’s 2004 Paso Robles Peasant (Syrah, Mourvedre, Grenache, Counoise), was much fruitier and fuller-bodied than similar wines offered by the French wineries. Then there were the Zinfandels - like last year, we particularly enjoyed tasting the diverse selection of these wines. Our favorites were from Lodi’s Abundance Vineyards and Jessie's Grove Winery, Paso Roble’s JanKris, and a couple zins from Four Vines Winery. Four Vines offered Zinfandel made from grapes grown in Sonoma, Paso Robles and Amador County and was interesting to notice the distinct differences in each wine. The best in the group was The Maverick made from 100 year old vines in Amador County and then The Biker -made from Paso Robles vines. For the international wineries we concentrated on the European visitors and are favorites were from the republics of Georgia and Moldova, Hungary, Italy, Portugal, Austria, and a new winery from Liechtenstein, Hofkellerei des Fursten Von Liechtenstein. Although based in Liechtenstein, the grapes and winery are actually located in Austria where the winery has a very unique history. The Princely House of Liechtenstein has been growing grapes in their Austrian vineyards since the early 1400s where the wine was used primarily for entertainment in the family’s castles in Austria, the Czech Republic and Liechtenstein. Immediate before the Second World War, the family fled Austria to neutral Liechtenstein, but retained ownership of the vineyards. Although displaced from Austria, wine production continued and today Hofkellerei des Fursten Von Liechtenstein is owned by Prince Hans-Adam III – Liechtenstein’s head of state. Our favorite wine was their 2003 Merlot-Zweigelt blend, which displays the depth of the merlot and the fruitiness of the Zweigelt. These wines are available through their distributor, Dionysos Imports (571-437-4490). Another Austrian wine we liked even more was Anton Bauer’s Wagram Reserve, a blend of Cabernet Sauvignon, Blaufrankisch, Zweigelt, Merlot, and Syrah. This is a full-full-bodied wine with spicy – piney aromas and a long smooth finish. If this wine is too strong for your tastes, try their fruitier Zweigelt 2005. Traveling East from Austria we tried several wines from Hungary, Moldova, and Georgia. The Törley sparkling wines, produced from a 125 year old winery, were better than the French Champagne we tasted that day. To add insult, Törley even advertises that they had become a popular drink in Paris as well. The other Hungarian wines poured at the Expo were from the Craftsman™ Series from Hilltop Neszmély Winery. These wines included the light-bodied Királyleányka (think Chenin Blanc), Cserszegi Füszeres (think Muscat- Gewürztraminer), Pinot Noir Rose, medium bodied Cabernet Franc, and the Bordeaux-ish blend Falconer’s Cuvee. All are worth a try. Graystone Wine Imports provided excellent examples of Moldovian wine which effectively explained why Moldovia is one of the top 10 grape-wine producing countries in the world. Moldavian winemaking dates back 2,000 years, starting with the early Greek and Roman settlements. The wines provided at the Expo were familiar vinifera varietals with our favorites being the Cabernet Sauvignon and Merlot. Two sets of Georgian wines rounded out this region. We discussed Georgian wines last year, so for now we will just reiterate that you should visit the Dozortsev & Sons and Georgian House websites to learn more about these great wines. We also tasted several excellent Italian and Portuguese wines. From Italy, we tasted a very good Montepulcoano-Sangiovese blend called Saraceno provided by Iatesta Imports. We also liked the Meron (Primitivo) from the same importer. From Portugal, we are fans of Touriga Nacional, and we tasted a few excellent versions from Quinta D’Aguierira and Encostas de Estremoz. Then the port became too tempting. World Shippers & Importers provided two excellent bottles from Quinta da Peca, a Reserva and 2000 Late Bottled Vintage. These were followed by two Royal Oportos provided by Admiral Imports, a standard Tawny Port aged 3-5 years and their 10 Year Old Tawny. This last was awesome, with nutty and caramel flavors and an orange finish. After tasting the several ports, we ventured back into the domestic arena to try a few dessert wines. Maryland’s Linganore Winecellars offered an excellent Abisso, made from Maryland grown Cabernet Sauvignon and naturally fermented to 18% alcohol. No fortified spirits were added to this wine. Rockbridge Vineyards and Standing Stone Vineyards each offered a Vidal Ice Wine, although the Rockbridge version is actually a late harvest wine whereas Standing Stone’s is an actual ice wine. In any case, both were excellent with apricot flavors and a balanced finish. Another good dessert wine was provided by Covey Run’s Semillon Ice Wine. Whereas most ice wine is made from Vidal or Riesling, this was the first Semillon that we had tried. It is different in that with the previous grapes you usually get an apricot flavor; this wine displayed a more citrus flavor. There is also a strong vanilla aroma that continued to the finish. Nicely done. After finishing these wines, we realized that there was a German ice wine being offered by Hauck Winery. This was a 2000 Riesling Icewine that showed that Germany continues its historic role in producing this type of wine. This ice wine had a strong apricot flavor balanced with a nice sweet, acidic finish. Once again we failed to visit the South American, Australian, New Zealand, and South African booths. With so many quality wines it is difficult to stay sober and make it through each winery. Next year we will begin with these wineries in order to broaden our knowledge of new world wines. We hoped everyone had as much fun as we did and we look forward to next year’s festival. “And the song of the Wine/This greeting of mine/The wines and the birds shall deliver/To the Queen of the West/In her garlands dressed/On the banks of the Beautiful River.” This Ode to Catawba Wine was written by Henry Wadsworth Longfellow nearly 150 years ago, when Catawba wine was one of the most popular wines in the United States. The catalyst for Catawba’s rise was Nicholas Longworth who pioneered its development in Ohio and whose sparkling Catawba, America's first champagne, was the object of Longfellow’s poem. The Catawba grape flourished along the Ohio River and in the hills surrounding the city of Cincinnati. By the mid 1800’s, Ohio was producing twice as much wine as California and supplied 1/3 of the U.S. wine market. However, disease and neglect soon after the Civil War lead to the decline in Ohio winemaking and Catawba’s popularity. Catawba is a hybrid of labrusca and other native species and is thought to have originated by a chance seedling in North Carolina. The grape is named after the Catawba River located in the state’s Piedmont region. It is generally used to create sweet wines and its high acid content is favorable to sparkling wine production. Catawba is also known for its “foxy” aroma - a unique aroma/flavor profile variously described as wild and musky. In present day Ohio, Catawba is no longer produced in large quantities near its original home near Cincinnati, but is produced on a regular basis by the Ohio wineries located near Lake Erie. Klingshirn Winery, Heineman Winery, Dankora Winery, and Old Firehouse Winery are among these wineries which create several versions of wine from this grape. In New York State, Catawba is very popular and in 2005 three Catawba wines won Governor’s Cup medals. One New York winery, Barrington Cellars has been growing Catawba for over 50 years and states that the American public has a strong desire for the sweet wines made from this grape. The most famous winery to produce wine from Catawba is New York’s, Brotherhood America's Oldest Winery. As the name suggests, this is the oldest continually operating winery in the United States. The winery was founded in 1839, survived Prohibition by selling sacramental wine, and was probably the first winery to produce Catawba wines commercially. Cesar Baeza, the winery’s current wine master, possesses an extensive wine background, having studied and worked in such diverse areas as his native Chile, Spain, Germany, Romania, and Bulgaria. From this experience, he recognizes and appreciates that each region should produce wines that will demonstrate these regional strengths. Fortunately for American wine drinkers he has settled in New York to produce wine from Native American varieties. In fact, he has concluded that Catawba grapes are an ideal grape for making New York sparkling wine. The high malic acid in the Catawba grape and its low sugar content make it perfect for the "cuvee" for champagne. Historically, Brotherhood's sparkling wine has been internationally famous ever since the Catawba-based Brotherhood Champagne won a Gold medal at the 1900 Paris Exposition. Europeans still consider New York to be one of the best regions to produce "Methode Champenoise" (fermented in this bottle) sparkling wine. Catawba has also found a home in other states such as Pennsylvania, where at least 20 wineries bottle this grape as well as in Illinois, Indiana, and Missouri. Eventually more wineries will be added to this list as Midwestern and Northeastern wines become more familiar to the American public. At our winery directory at Wine-Compass.com we have implemented a new Weekly Compass tab that contains the latest feeds from your favorite wine bloggers. This feature means you have one source to read the latest posts instead of navigating to each blogger's site separately. Let us know if we are missing your favorite wine blog and we will add it to our list. Silver Springs Winery, located in Seneca Lake New York, has introduced an interesting concept for wineries - online tutorials at Wine101.TV. The tutorials consist of discussions on wine tasting and grape varietals. The first few episodes pertained to the labrusca varietals Catawba, Cayuga, and Delaware. The latest episode discusses Cabernet Sauvigon. The proprietors of Silver Springs Winery are Sari and John Zuccarino, whose Italian heritage includes 700 years of winemaking. The winery produces several types of vinifera and labrusca wines under the Don Giovanni and Silver Springs labels and some were recently recognized by Catherine Fallis (the world's fifth female Master Sommelier) in her latest book, Great Boutique Wines You Can Buy Online. 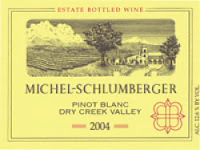 A relative recently gave us a bottle of Michel-Schlumberger's 2005 Pinot Blanc that they had received through their California wine of the month club. We eagerly opened the bottle in order to sample a California wine, since lately, we had been trying to reduce our surplus of east coast wines. The Alsace native Pinot Blanc thrives on the hillsides near the Pacific Ocean, where the cool air allows the grapes to ripen slowly, producing ripe flavors without excessive sugar. This wine is made extremely dry, but the finish is very refreshing; the citrus aroma continues through the body and finish. Aging the wine in steel allows the grape's fruitiness to dominate with a slight spiciness for balance. We would strongly suggest serving this wine with a meal, the winery suggests Thai, but we feel the wine should compliment both spicy and milder foods. The wine retails for $21 so it's a good alternative to higher priced chardonnays or any Pinot Grigio. In 1812, Joseph Bonaparte, the former King of Spain and brother of Napoleon, fled political chaos in his home country and settled in Bordentown, New Jersey. There he built an estate called Bonaparte Garden. At the time, New Jersey wines were internationally renowned for their quality and London's Royal Society of the Arts had recognized two New Jersey vintners for their success in producing the first bottles of quality wine derived from colonial agriculture. Mr. Bonaparte planted vines on the fertile soil of his estate and legends suggest that vines from this estate led a grape revolution. In 1837, Benjamin Heath, a blacksmith and wheelwright, moved to Concord Township from Frenchtown, New Jersey. He carried with him a grape that allegedly came from the Bonaparte Garden. Mr. Heath cultivated the grape for a number of years on his farm in Concord Township, Delaware County. Compared to other native varieties, this grape had a delicate fruity aroma and only a slight foxiness in the taste. He recognized the excellent qualities of the grape and shared cuttings with neighbors and friends. One of these neighbors, Abram Thomson, editor of the Delaware Gazette, was so impressed with the characteristics of the grape that, in 1855, he sent a specimen to the Massachusetts Horticultural Society for their study. The Society was thrilled with this new grape and called it the “Grape from Delaware, Ohio”. The American Horticultural Society also recognized this grape and demand increased dramatically due to the world-wide marketing of its qualities. Delaware grapevines were sold in enormous quantities at prices ranging from $1 to $5 per plant - an exorbitant amount at a time when the average unskilled laborer made only about $1 per 12 hour workday, making the cost of the grapevines by today’s money from $72.00 to $360.00 each. This instigated a “grape fever”, similar to the California Gold Rush, where speculators attempted to grow and cultivate the grape in order to reap the enormous profits. As expected, most failed, since these entrepreneurs did not possess the necessary horticultural skills. Over time, demand for the vine declined and eventually leveled out after Prohibition. Today, the Delaware Grape is grown throughout the Northeastern US, especially New York, and in Ohio, along Lake Erie. It is widely used in some premium champagne blends and in a few, used to produce a dessert wine and to make a light fruity semi-dry drinking wine. One New York winery, Vetter Vineyards, is located along Lake Erie and vinifies the Delaware grape into a blush wine with apple, cherry and mild grape flavors. The winery’s owner, Mark Lancaster, has been making wine with this grape for almost 20 years and believes that it is a great regional grape. In fact it makes some of the most popular wines in Lake Erie region. He adds that entering the grape into competition would not increase sales since many people in the Lake Erie region are already familiar with the product or discover its great qualities after tasting it. Unfortunately, Mr. Lancaster predicts that cultivation of the grape will slowly decline since many vineyards are replacing it with Riesling in order to increase the yields of their vineyards. This trend has not stopped a few wineries from producing excellent wine from the Delaware grape. 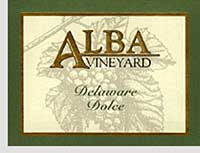 New Jersey's Alba Vineyards produces an award winning dessert wine, Delaware Dolce, from grapes grown not far from Frenchtown. In Minnesota, Saint Croix Vineyards produces a drier wine that has won medals at the International Eastern Wine Competition and the Indiana State Fair. In sum, there are about 30 wineries making Delaware wine, primarily in Pennsyvania, New York, and Ohio. Hopefully one is near you. On February 23rd-25th, Wine Compass editors participated in the 6th annual Food Network South Beach Wine and Food Festival. Held in South Beach, Miami, this three day event stretched across several blocks of fine sand on the breath-taking beach. The tremendous turnout was expected, since tickets were sold out weeks in advance. The three days were filled with wine, spirits and food tasting accompanied with food demonstrations by popular Food Network personalities like Emeril, Rachael Ray and David Lieberman. With glass around the neck (due to fabulous contraption which were provided by Target), flip-flops on feet and the excitement in the air, the crowds filled the tents, growing larger each day. Even though the wine and spirits exhibited were only those distributed by Southern Wine & Spirits of Florida, there was a large selection of excellent wines from throughout the world. There were French wines, Italian and Spanish wines, wines from South America, and of course, North American wines. We were also impressed with the large number of rum distillers, including retailer Tommy Bahamas. Their new rum line was smooth and refreshing; smooth enough to sip over ice or as a mixture with fruit in your favorite collection of boat drinks. As for the wine, we had the privilege of meeting with three distinct wineries with vast differences in appellation but similar passions in winemaking. Cubanisimo Vineyards owned by Mauricio Collada, Jr., a neurosurgeon found his passion for Pinot Noir during his residence. His personality emulated the bold, full bodied taste of his wine. As written on of each bottle, he extends his desire through his wine to enhance consumer’s life through the palate. This Oregon winery is now producing a rose style Pinot Noir to complement their full bodied red. Click here to view our earlier review of Cubanisimo Vineyards. Our second stop was at the only Canadian exhibiter - the Mission Hill Family Estate Winery - located in British Columbia. We were very surprised to find that a Canadian winery had supplied such fine wines. We were most impressed with their ice wines. In order to make ice wine, the grapes must remain on the vine for 3 weeks at -7 degrees. This concentrates the sugars in the grape that produces the sweetest dessert wines we had the pleasure to sample. The cost of this special wine is evident due to the fact that it takes seven times the amount of grapes to make one narrow bottle and the conditions must remain perfect in order to harvest the grape. Click here to view our earlier review of Mission Hill Family Estate Winery. In a completely different realm, we came upon the Gnarly Head representatives. The personalities of these California wines were evident from the bottle decor to their signature wine - Joe Blow Red. Noted as “almost a 100,000 mistake”, this wine was conceived after no one claimed a crate of grapes, so with innovation and quick thinking they produced a concoction that would withstand any critic. The “surfer” laid-back image definitely has an appeal to the 20-30 something generation, both at the festival and probably in California. Click here to view our earlier review of the Gnarly Head Zinfandel. Another California winery we enjoyed visiting with was Bernardus Winery; our favorite wine, their 2005 Monterey County Pinot Noir. This Carmel Valley winery produces Pinot Noir from grapes grown in three different growing areas in Monterey County. This is a full bodied wine that exudes a raspberry nose with a soft, silky body. The finish is long and slightly spicy. We could continue forever, describing the great wines we tasted at the festival. A better idea is to convince you to attend next year’s event. The dates for the 7th annual Food Network South Beach Wine and Food Festival have already been set: February 21st-24th 2008. We have already made our hotel reservations. See you there. We've been drinking alot of dessert wines lately and one of our favorites is Alba Vineyard's Delaware Dolce. The wine consists of 100% Delaware grape, named from the surrounding Delaware County or Delaware River. Alba Vineyard's Delaware grapes are grown in their vineyards just 2 miles from the Delaware River. This grape is a native Labrusca that we will discuss in next Monday's Wine 101 posting. The Delaware Dolce reminds us of the great Tokaji Aszu wines. In fact, it has won medals at several international wine competitions such as the Pacific Rim International Wine Competition, the Florida State Fair International Wine Competition, the Finger Lakes International Wine Competition, and the Taster's Guild International. The wine's nose is a combination of pineapple and honey; whereas the flavor is fruity, primarily apricot. At the finish, the muskiness of the Labrusca grape is barely distinuishable. Instead the finish is balanced between sweetness and acidity of the wine. At $19.99, the Delaware Dolce is very affordable as compared to the Tokaji or other premium dessert wines.